Fasten your seatbelts for March, usually our busiest month. Re-enrollment contracts for the 2017-18 school year are due Wednesday, March 1. Re-enrollment will continue to be done online. Click here to log in. If you have any questions regarding this process, please contact Irmgard Dan at (818) 949-5517. It is vital that all current parents adhere to the March 1 deadline. New applicant decision letters and financial aid decisions will be e-mailed on March 10. We’re just a couple weeks away from Flintridge Fever, Let’s Groove Tonight, which will take place at the beautiful Vibiana in downtown LA on March 4. Money raised from the benefit will go toward a fully enclosed atrium outside the newly renovated Norris Auditorium, providing indoor dining and meeting space for our community. RSVP by February 22 at www.bidpal.net/prepbenefit2017, and visit the Flintridge Fever Facebook Page for special benefit announcements. The silent auction catalog will be available Thursday, February 16 at the link above. This year’s auction has a variety of fabulous items, largely due to our generous parents and the entire Prep community. A big thank you to everyone for your participation. Online bidding will open on Thursday, March 2 and close the night of the gala. RSVPs are coming in fast to hear Peter Gray, PhD discuss "The Decline of Emotional Resilience Among Adolescents and Young Adults: Causes and Potential Solutions.” The event is free, but please RSVP at www.flintridgeprep.org/speaker. Join us at La Cañada Presbyterian Church for light refreshments beginning at 6:30 pm, followed by our presentation at 7:00 pm. The Speaker Series is an adult education program designed to educate, entertain and inform our school community of parents and extended family members, supporting the school’s goal to encourage life-long learning. March 11, the ACL is hosting the La Mascota 5K Run/Walk to raise awareness for La Mascota Hospital, the only pediatric cancer hospital in Nicaragua. Stay tuned to the event Facebook page, and click here to sign up. To donate to the cause, click here. The ACL looks forward to making this a big success with your help and support. On Monday, May 1, the Fathers Club welcomes all parents, faculty, staff and alumni to attend the annual Flintridge Prep Golf Tournament, which includes the golf tournament, wine tasting, dinner and a silent auction. Email John Brown for more information. Click here to reserve your event tickets. Read the latest installment of “Conversations in Education,” a blog for parents that organizes interesting topics in education. This month’s post provides a sneak peek into Middle School Community Service Day. You can find the blog, which is published monthly, by clicking here or by visiting the Parents Portal. To subscribe, click the blue Alerts button at the top of the page. Thank you to those who have already contributed to the Annual Fund. Please contact Donna Merchant at 818.949.5525 or dmerchant@flintridgeprep.org with your commitment or questions. Visit www.flintridgeprep.org/support to make a contribution. The winter sports teams are finishing Prep League games, with four programs bound for CIF playoff action. Girls basketball clinched its fourth straight League title and is ranked second in CIF. Girls soccer won its second consecutive League title and is ranked sixth in CIF. Boys soccer has clinched at least a share of the League title, its first since 2006, and is ranked 10th. Boys basketball has a chance to tie for the League title and is coming off a thrilling overtime victory vs. Poly. Girls water polo finished tough League competition, excited for the future. Come cheer on the Rebels in CIF! February 4, the ACL spent all day cleaning men’s and women’s dorms, bathrooms, a kitchen and dining hall, along with preparing and serving lunch to the homeless at the Adult Homeless Center in Pasadena. 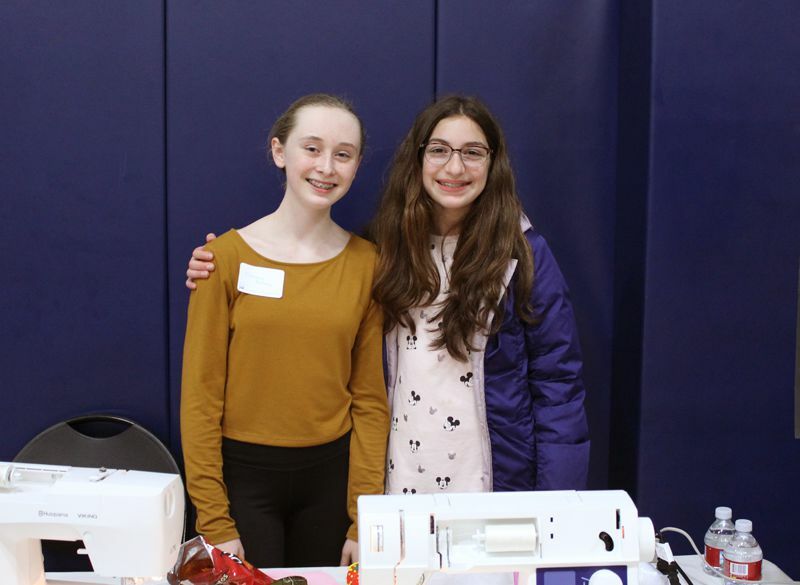 They also took part in this year’s STEAM & Service Fair as judges, recognizing students whose Community Impact Projects incorporated sports and service impact. On February 17, the ACL Spirit Committee will host Winter Pep Assembly to recognize all Winter HS athletic programs and teams that will be advancing to the CIF playoffs. The ACL would like to invite everyone in the Prep community to be part of the initiatives throughout the year. If you are interested in helping, please contact Alex Rivera, Director of Athletic Initiatives. ACL news, events, updates and photos can be found here. Juniors have begun initial meetings with their college counselors. Once your student has had an initial meeting, you are invited to schedule a meeting with his or her college counselor. Parent meetings are optional and will begin at the end of February and run through March. Mandatory family meetings will take place in August for all rising seniors and their parents. All juniors should be registered to take the SAT either in March or May or the ACT in April. All sophomores and juniors taking SAT Subject Tests in June should register in May. Please refer to the handout received on College Night for additional testing information. The College Admission Case Studies Program for juniors will be held on Tuesday, April 25 at 7:00 pm at the Westridge School. Parents will receive a packet of information in advance of the program. The College Boot Camp for rising seniors will be held on June 8 and 9. Please encourage your junior to complete the registration form by May 1 to reserve a space. Registration forms will be distributed in college counseling class. Students taking AP and relevant honors courses at Prep may begin registering for AP exams the week of February 13. The deadline to submit payment without late fees is Friday, March 10. All payments should be addressed to Flintridge Preparatory School and delivered to Irmgard Dan in the business office. On Friday, April 7, we will welcome our new incoming fathers at our annual Fathers Club New Dads Mixer, which is being hosted by Manny and Jane Abascal at their residence in Altadena. At the spring mixer, we introduce new dads to the Prep family and share how the Fathers Club supports the school through volunteering efforts and initiatives. For more information, email Eric Panajotovic. Dads, click here to reserve your event tickets. There will be no Parents Association meeting in March since we have two special events planned for you! Our next meeting will be at 8:15 am on April 11 at La Cañada Country Club. Look out! Here comes Prep's spring musical, Little Shop of Horrors, Broadway's monstrous hit, arriving this March for two weekends only. Performances are March 3, 4, 10 and 11 at 7:30 pm in Norris Auditorium. Tickets will go on sale in mid-February for $10.00; check the school website for further details. Congratulations to all of the participants at the STEAM and Service Fair. A special kudos to the first place winners in each of the categories. Please join us throughout March for our many events.